• Support the networks to develop more inclusive advocacy actions for the future in response to the needs of all citizens within their target areas. • Finalize on what the networks have done, so that they are ready for the funding opportunities. The training started with an open remark by Mr. Sun Youra, the National Development Program Manager. In his welcome speech, he gave an overview and background of EU project under the coordination of VSO. 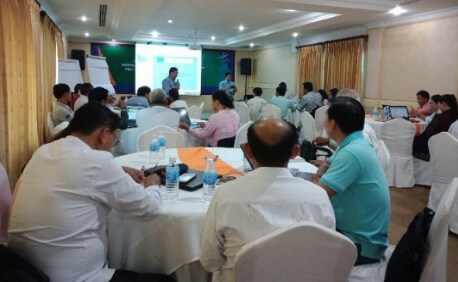 He noted that the EU project aims to strengthen the capacity of eight provincial networks in Siem Reap, Kratie, Stung Treng, Kampong Thom, Prey Veng, Svay Rieng, Mondulkiri, and Rattanakiri, specifically on Organizational Development (OD), Resource Mobilization (RM), Knowledge Management (KM), Advocacy and Gender Mainstreaming. This consortium project was jointly implemented by three NGO partners: NGOF, CCC and GADC. Moreover, he continued that VSO manages the grant and the project including the small grants. This project has a steering committee and focal point to implement the project. In addition, he highlighted that The NGOF has done advocacy assessment for all the eight provincial NGO networks and produced the report based on this assessment while the small grant is on the process to finalize. On the other hand, the NGOF still has two main tasks more including small grant project & fact findings and advocacy plan (influencing strategy). Therefore, the event aimed to improve the advocacy plans and to develop advocacy actions by the end of that 2-day training. Furthermore, he mentioned that working with the network has three main issues – networks, people who are directly involved with vulnerable people, and can collect data from them as much as possible when the project needed. Each case study, which we can call short-term, also builds and collects evidence-based. Second, the role of the provincial network is directly linked with provincial, district, and commune authorities. Third, in the case that each province cannot resolve, the network in each province could link them to national level. He also informed to the participants that the Ministry of Interior was required to submit a letter of notification enclosed in the agenda of the meeting or event at least three days before the commencement of the activity at sub-national level. Finally, he thanked the eight provincial NGOs networks again for continuing implementation of the EU project, even though the project is almost completed, and as an advocacy, we continued to work and seek support for the future. Mr. Keo Bunly, the National Development Policy Coordinator, took the participants through the reflection on the current small grant project implementation. Throughout this section, the group worked together to discuss about the key achievements and challenges they faced in working with small grant projects. In the meantime, they also discussed about the next planning such as which activities they should be prioritized. He presented and shared with the participants about the terminology of “Influencing, Advocacy and Stakeholder Engagement”. The key messages during the training workshop were that influencing, advocacy or engagement, the main purpose is the “Change”. The “Change” will follow key questions (What, Who and How). After explanation, Mr. Bunly asked all the networks to draw their vision map in relation to their selected sectors. Mr. Bunly presented the “Strategy Development”. He focused on three main points on building an advocacy strategy such as analysis of key actors, key intervention, and activities. He then gave details in each point. Key actors refer to who can make change, who can make decision, and who influences. Key intervention is a different tool that can be used to engage with the key actors. 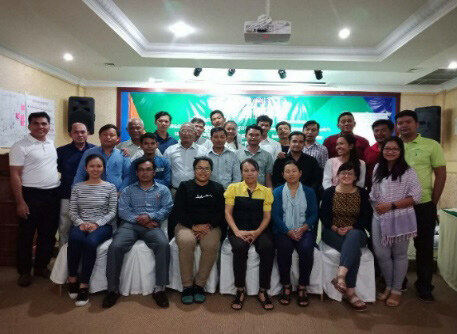 The Network’s Influencing Strategy training was completed timely and there was suggestion to do it next time during the advocacy training. All provincial NGOs networks promised to bring this advocacy plan to put into practices in their respective provinces and show strong commitment to implement the activities in response to the outcome. The advocacy actions have been developed and they are ready for funding opportunities. The training was thus successful and fruitful.